At the tail end of 2014, Scott Lobdell, RB Silva, and Wayne Faucher, gave their best on this book, by showing how they got the team fighting violent deer, a psychotic Santa Claus, plus a bunch of rad drug induced demons and douche mentors. Yet how can they top that in January, 2015? Easy, my friend's. Very easy. By befriending dragon men, of course! To QUOTE Brendan Fraser: “I guess darkness serves a purpose: to show us that there is redemption through chaos. I believe in that. I think that's the basis of Greek mythology”. So now that Roy’s out of danger, all he and Jay have to do next is search for Kori. Luckily, the guys have the perfect plan up their collective sleeves: Find Crux and ask for his help. Just drop by and ask him some questions. Easy enough, isn’t it? Man, if only all the comic book stories were this simple to follow. Huh? What's that you say? I’m forgetting something? Let me think. Hmm. Oh!! I know what it is! Jason is a wanted criminal, and Crux was put into Arkham by the Outlaws! So Jay has to now break into Arkham and get the dragon man out, even though he hates his guts and probably won't want to cooperate. No biggie. And once again, Lobdell goes against all expectations (even those set by the awesome cover!) taking the story into paths I never saw coming. However, for everyone to truly grasp Lobdell’s excellent writing, we need to go back three years and check out the origin story for this issue’s main protagonist: Doctor Simon Amal, AKA Crux. The first real threat the Outlaws ever faced. On his debut issue (issue 4 to be precise) Crux was this twisted, Batman-like guy, that instead of declaring war on crime, declared it against every alien living on earth. 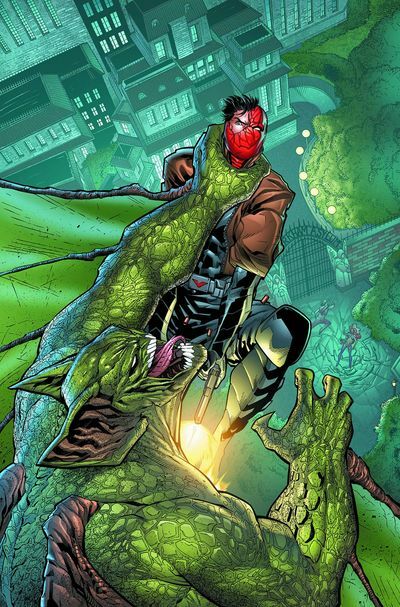 To accomplish this goal he used his own brilliant mind to turn himself into a humanoid dragon (with design cues from both Killer Croc and Man Bat). Awesome design, and cool concept, but ultimately, pretty flat as a character in his own right. 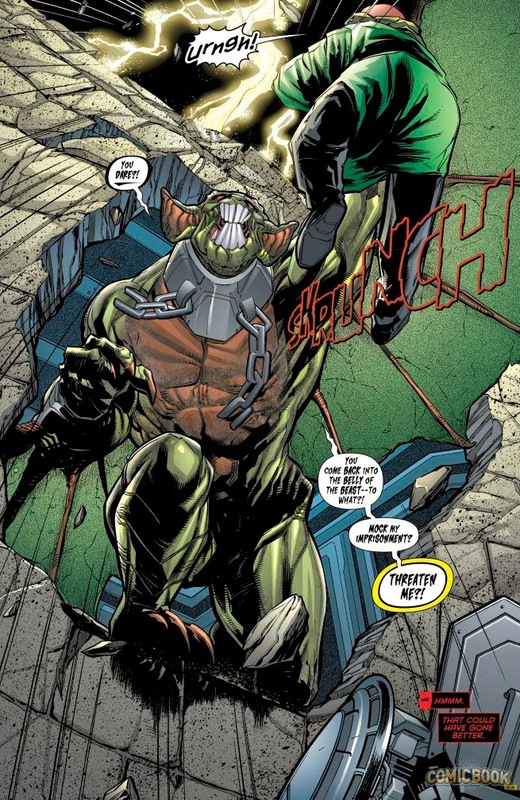 Aside from his backstory, he was just another xenophobic nut job, common at the start of the N52. Back then, Lobdell went on record saying that he originally envisioned Crux as a new team member, but fan response wasn't what he expected and passed on the idea -- thus the last we saw of Crux was him getting locked in Arkham Asylum. While his ship became an important part of the series (pretty much becoming a character in itself), Crux only got some passing mentions here and there but never showed up again -- not even as a background character on the multiple Arkham appearances through the N52. He seemed fated to the comic limbo when Lobdell unexpectedly brought him back on issue 36's cliff hanger. This caused mixed reaction through the entire reader base: Some accused Lobdell of bad writing. Others complained about Crux. While others, like myself, praised the idea of revisiting an old plot point. I like continuity on my comics, so the notion of bringing Crux back was very attractive to me. I had some ideas about how the imminent reunion would play out, yet it wasn't close to what Lobdell finally delivered on this issue. You see, I was expecting Crux to want a “Break me out of Arkham in exchange for my help” kind of alliance. But in a stroke of genius, Lobdell makes use of the amount of time which has passed since we last saw Crux, and gave him the character development he desperately needed. As the issue reveals, Crux was rehabilitated by Arkham’s staff. If Crux becomes a regular member of the cast, he can bring tons of new possibilities to the book, whether he’s just a Mission Control or as an active field agent. What's more, his affable yet snarky personality makes his interactions with Jason and Roy incredibly entertaining. I really hope he sticks around. I’m just repeating myself here, but Lobdell is the perfect writer for Jason and Roy. Even with the few interactions provided you can just feel that those two are true friends and how much their friendship means for them. The small Starfire’s scene at the end highlights perfectly why I like Lobdell’s take on the character. His Kori is a warrior, someone that can make mistakes but who only grows stronger from them. The sudden appearance of Blackfire is just the cherry on the top: We’re heading for a resolution of every plot point introduced on the book four years lifespan. Special mention to R.B. Silva’s excellent pencils, easily the best he has delivered on this series. So far the only weak link in this story is the Rose sub plot, and not because it isn't interesting but because it seems extremely unlikely that it will lead anywhere. Rose is a major player on the Deathstroke title, thus cutting short any plans Lobdell could've had with her. 'Heat of the Moment' by Asia strikes me as the perfect companion for any redemption story worth its salt. After all, most of our mistakes are caused by emotions running wild. When we have the time to cool off and look back at our actions, we always say “how I could do that?”. Just like our buddy Simon did on this issue. 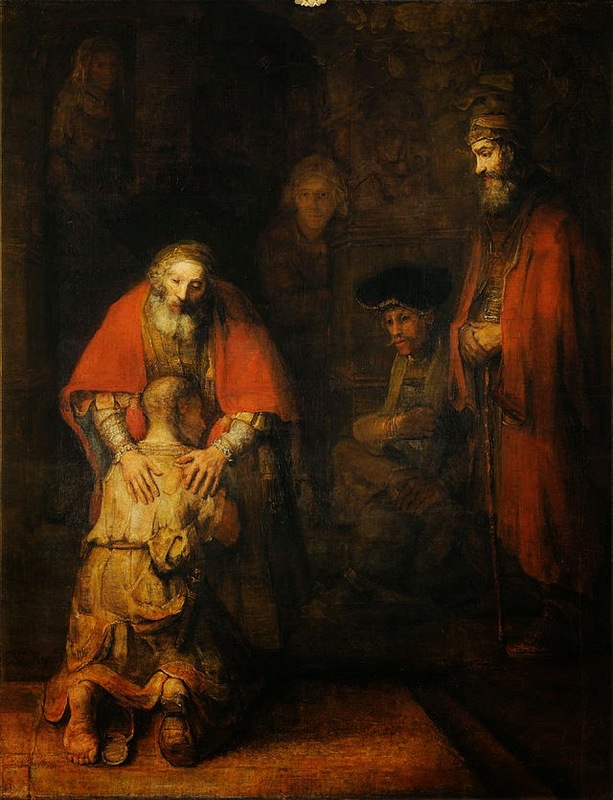 Forgiveness is the theme of this issue, and the heart-warming hug between Jason and Simon immediately made me think of Rembrandt’s masterpiece: The Return of the Prodigal Son. As many of you should know by now, Red Hood & the Outlaws is coming to an end on March with Red Hood / Arsenal taking over its place in June. For this reason Lobdell is giving closure to any loose ends and setting the stage for the epic conclusion of the series. Alliances are forged, betrayals are made known, and every character is getting ready for the final battle. Normally this would be just PR speak to get the readers hyped, but Lobdell has proven again and again that RHATO is his pet project, one that only gets his best work. Thus, I have no doubt we will get a truly epic finale, and hopefully, all of you will be reading it along with me.